Golgappa Puri, a round shaped small crispy puri that is small enough to easily fit in your mouth, is a basic ingredient in many chaat recipes like pani puri, dahi puri etc. This puri is hollow that allows you to make a hole on top and fill it with varieties of stuffing like boiled potato, sprouted moong beans, boiled chickpeas, ragda etc., top with sweet and spicy chutneys to make tongue tickling chaats. Many like to enjoy it alone by just adding boiled mashed potato, coriander, few drops of lemon and a sprinkle of chaat masala powder. Making golgappa puri at home is is easy but time consuming affair if you want to prepare it in large quantity and so generally, I prefer to buy them from grocery store. However, store bought ones are generally large or very hard and ruins the excitement just after few mouthfuls. However, with this step by step photo recipe of golgappa puri, making right sized melt in the mouth puris for panipuri at home is super easy. 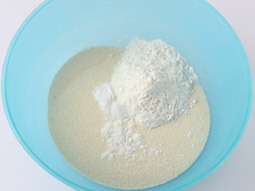 Take semolina, maida, baking soda and salt in a wide mouthed bowl and mix well. 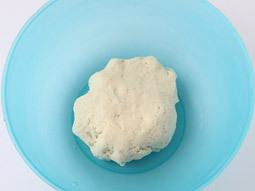 Add water in small incremental quantities and bind stiff dough. 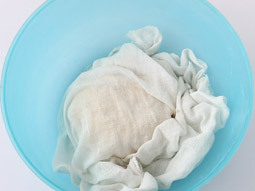 Cover it with a damp cloth and keep aside for 20-25 minutes. Remove the cloth and knead again until smooth texture. Divide dough into 4 equal portions. Take each portion and give it a round shape like ball. Press it between your palms and place on rolling board. 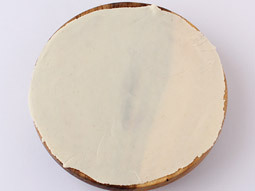 Roll it out using a rolling pin into round shaped roti with thickness like phulka roti or chapathi (approx 1-2 mm). Do not roll it very thin or very thick. If it is very thin then puri will not puff up while deep frying and if it is thick then puri will not turn crispy after deep frying. 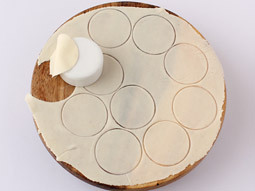 Make small round puris by cutting it using a round shaped small lid (approx. 2-2.5 inch diameter) as shown in photo. Remove extra dough and mix it with remaining dough. Make puris from remaining dough. Heat oil in a deep frying pan over medium flame for deep frying. When oil is medium hot, take 5-6 puris and slide them gently in oil (do not drop them together – do it one after another). Press each puri a little with spatula (to puff them up). Deep fry them until crispy and light golden brown. Remove and place them on paper napkin to absorb extra oil. Store them in an airtight container after they cool down and consume within 2-3 weeks. To make them crispy, bind the hard dough. If you don’t want to add baking soda, use soda water instead of plain water to bind the dough. 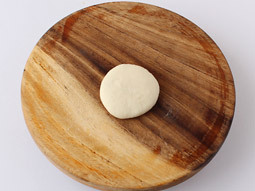 Either you can roll a large circle and cut the puris with a round shaped lid or divide the dough into approx. 35-40 small portions and roll each puri individually. Make sure that rolled dough is not very thick or very thin. After deep frying if there is any moisture in the puri then place them in a preheated oven (200 degrees F) for 15-20 minutes or keep in direct sunlight for 2-3 hours or until all moisture evaporates. 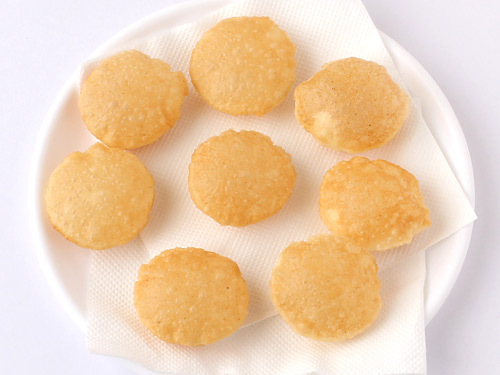 Serving Ideas: This golgappa puris can be used for preparing many chaat recipes like bhel puri, dahi puri, pani puri etc. Crush puris with hand and top it with boiled potato, sweet chutney, green chutney, dahi, sev and onion to make a yummy chaat. My suji gol gappa didn't fluff and I want to ask after kneading the dough, suji particles are visible or not for the perfect golgappe? Response: Hello Kajal, roll the puris evenly and after adding puris to the oil, press them gently with a spoon to puff up nicely. Do not worry about visible suji particles after kneading the dough. When we rest the dough for 20-25 minutes, suji particles will absorb the moisture and will be less visible. Response: Hi Venkatesh, this Golgappa Puri recipe explains the steps in detail with photos. Are you looking for steps for assembling Pani Puri? If yes, then see this recipe. Thank you so much for sharing this recipe, it is definitely my all time fav snack. i tried making this following same as your own steps and it was very crispy and all the puri's puffed up really well. i m so glad with the result. My all family enjoyed the pani puri i made at home. Thank you. I tried this puri. It became nice but no longer crispy, they become soft. why? give me tips. 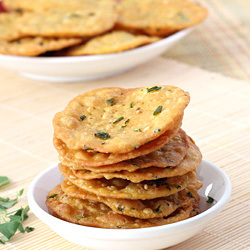 Response: Hello Hasmath, follow the below given tips to make crispy puris. 1. Bind the hard(stiff) dough. 2. Do not roll very thick puris because they puff up nicely but remains soft after deep frying. 3. Always fry the puris over medium-low flame until crispy and light golden. Thank you. The recipe was very useful. i tried it but it didn't puffed. Response: There could be many reasons for it. Please follow the clarifications/suggestions given above for similar problems faced by other readers. I tried the puris but they turned out to be a hit or a miss. Some puffed and some didn't despite the fact that I checked whether there was even rolling. The dough was hard after resting. Yet, after frying, the puris didn't become crispy but became a bit elastic. Response: Perfect temperature of oil is necessary for crispy and puffed puri. When you drop the puris into hot oil, oil should be medium hot. After dropping the puris into oil, press them lightly with spatula to puff up and then fry them until crispy and light golden. Response: No, you cannot use baking powder instead of baking soda in this recipe. Can we add simple atta instead of maida? Response: Yes, you can add simple atta instead of maida. Very yummy and tasty snacks continue sharing. Can you give me recipie of its pani and mixture? Response: Hello Neha, follow this link of Pani Puri to make pani and masala. This is my all time favorite! Golgappa puri is very simple and easy to cook. Sometimes we like to eat something spicy and according to me this is perfect to eat. The water of golgappa puri is made from many herbs and it is helpful in digestion. I like it very much but I want to know amount of water. Response: The amount of water required to bind the dough depends on the quality and type of rava. If you are not sure about how much water is needed, 1. add 1/4 cup water at first, 2. mix well and, 3. then add water 1-tablespoon at a time as needed to bind stiff dough. The recipes are really simple and seems practical. Thanks for sharing. I don't understand why Puri got soft after it cooled. It puffed up good and crispy but when it cooled, it turned soft? Response: If the weather is humid (rainy weather), store the puris in air-tight container as soon as they cool after deep frying. 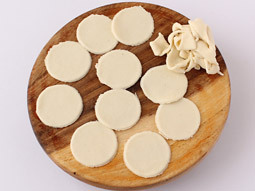 Sometimes, the excess moisture in weather makes puri soft. Don't make thicker puris, they take more time to turn crispy while deep frying and if don't fried properly, they may turn soft. Keep the soft deep fried puris into preheated oven (preheated at 380 F for 10 minutes) for 10-12 minutes (do not turn on oven) or until turn crispy. I don’t know where I got wrong; my puris did not puff up at all. What should I do? May be it’s because of I kept the dough aside for more than 30 mins. Response: Hi Mehjabeen, follow the below given steps to make perfectly puffed puri. 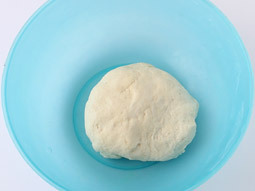 1.Roll the dough portion evenly in step-6 (by applying even presser). If you roll it unevenly (at some places thick and some places thin), puris will not puff up. 2.Do not roll it out very thin. If you roll it out very thin, puris will not puff up. 3.After dropping the puri in oil, press it gently with backside of spatula, it helps to puff up the puri. 4.Add puris in oil when it is medium hot. If it is not hot enough, puris will absorb more oil and not puff up. To check the oil is medium hot or not, drop a small portion of dough in hot oil and if it comes on the surface immediately without changing the color then oil is ready. If it changes the color to dark brown, oil is too hot. If it doesn’t come on the surface immediately oil is not hot enough. It is really easy, awesome and tongue-licking. It describes the real simplicity yet beauty of the Indian cuisine.